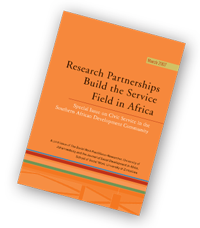 This is a joint special issue of the University of Johannesburg's The Social Work Practitioner-Researcher and the University of Zimbabwe's Journal of Social Development in Africa that reports on VOSESA's Five-Country Cross-National Study on Civic Service and Volunteering in SADC. The study is particularly relevant in the context of regionalisation and globalisation where civic service is emerging as a growing social phenomenon and institution. 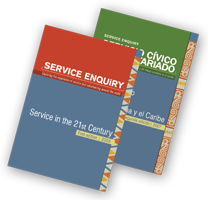 It thus contributes to building the knowledge base about service in SADC (for more information on the study, see the Research page). The articles in this special issue demonstrate how different actors in the region are co-operating to address the human development challenges in the five countries - Botswana, Malawi, South Africa, Zambia and Zimbabwe. The service initiatives reported on contribute to developing knowledge and good practice, and demonstrate the role that service and volunteering can play in promoting the achievement of national social development goals and priorities. The direction that service and volunteering is taking in the region is consistent with the key objectives of the Southern African Development Community (SADC) which aims to achieve regional co-operation, eradicate poverty and reach high levels of social and human development. The study was conducted through a unique North-South partnership between a non-governmental organisation, academics and higher education institutions that resulted in the pooling of expertise and resources. Partners included the Centre for Social Development in Africa at the University of Johannesburg, the Global Service Institute at the University of Washington in St Louis, Missouri, USA, Volunteer and Service Enquiry Southern Africa (VOSESA) based in Johannesburg, and universities of Botswana, Malawi and Zimbabwe.